Flip Flops & Pop Tarts: FEVER FEVER GO AWAY! 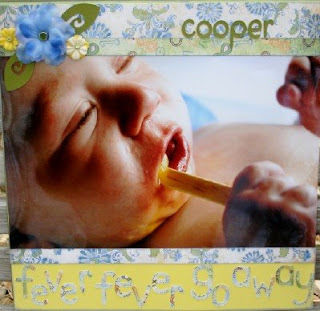 HERE IS COOPER WITH A FEVER, I KNOW IT IS A LITTLE DIFFERENT BUT IT IS LIFE AND IT WAS LIKE HIS FIRST POPSICLE. I USED THE LEAVES FROM WIMG, AND THE BASIC GREY BABY BOY COLLECTION AND PRIMAS AND BRADS. TFL!